Paul: The absolute "oldest" instrument with neck & fingerboard that I can find, 2500 BC. It is from the dawn of human civilization, the Sumerians. It appears on a clay tablet attached to the temple Bel between the Tigris & Euphrates rivers. 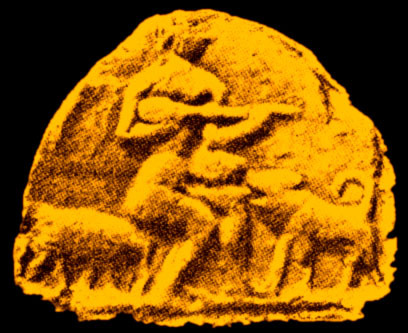 It shows a shepherd with a flock of sheep playing an oval shaped instrument with a neck 3 times the length of the body. He plays it right handed and his dog is shown (with jowls open) singing along with the music. One cannot make out details like number of strings, the existence of frets or type of tuning pegs. Playing herdsman on a terra-cotta plate from Nipper- circa 2500 BC (Hilprechts "Exploration in Bible Lands" page 529) Now in the Philadelphia Museum. Found by American archaeologists between the Tigris & Euphrates rivers, the discovery made of ancient Nippur, a city of ancient Babylon (The oldest culture of humanity - the Sumerians) according to Talmudic tradition "Calneh in the land of Shinar" one of the four capitols in Nimrods realm (Genisis x, 10). The next stringed instrument I can find in chronological order is from 1500 BC This one is too much. It is the Hittite castle ruins of Bos-ojuk in northern Asia Minor; a sculpture of a man standing, playing a stringed instrument, now in the Ottoman Museum, Istanbul. The body of the instrument has incurved sides (waist) and five sound holes. The incurved sides make this instrument closely resemble a guitar. It shows two strings stretched and tied to the head. On the fingerboard it shows a GRADUATED SCALE MARKED BY FRETS. It also has a plectrum tied to it via a ribbon. See this, plus another Hittite "guitarist" here!